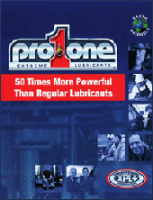 ProOne Engine Life Treatment features the XPL+ (Xtreme Pressure Lubrication) technology to bond to the metal in an engine providing extraordinary protection from heat and friction, and reducing wear especially during start-up when motor oil is not yet circulating. 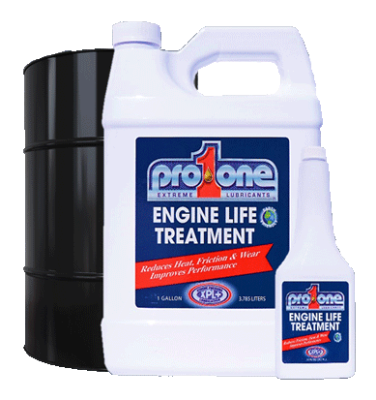 From lawnmower to a container ship, Engine Life Treatment will help extend an engine’s working life and performance. XPL+ (Xtreme Pressure Lubrication) – Metal bonding agent – Anti-wear agent – Seal conditioner Vegetable Based – No solids, chlorine or harmful solvents! – No solids, chlorine or harmful solvents! - Helps increase engine life. - Withstands friction & high temperatures. - Prevents oxidation & corrosion. - Protects & conditions seals. - Helps optimize engine performance. - Helps optimize fuel economy. - Protects engine from wear during start-up.